More than just a raincoat--can be worn every day, all spring, summer and fall. Comes with a free Kidorable hanger. Made from premium quality PU with a lightweight, comfy printed nylon lining. 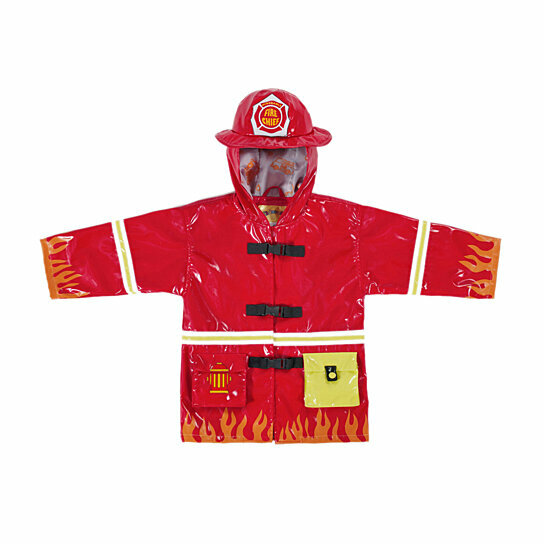 2 Fun Fireman pockets for extra play value, plus a Fireman helmet. Coat Size: 1. Model No: 1236-FMC1T. Coat Size: 2. Model No: 1236-FMC2T. Coat Size: 3. Model No: 1236-FMC3T. Coat Size: 4/5. Model No: 1236-FMC4-5T. Coat Size: 4. Model No: 1236-FMC4T. Coat Size: 5/6. Model No: 1236-FMC5-6T.